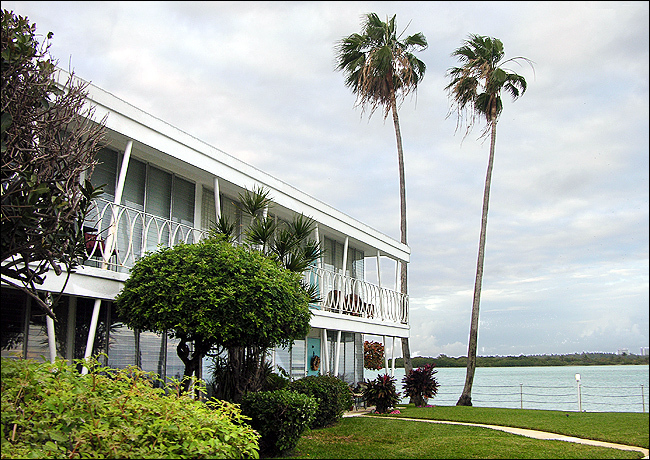 Dexter Filming Locations: Dexter's Apartment. A. 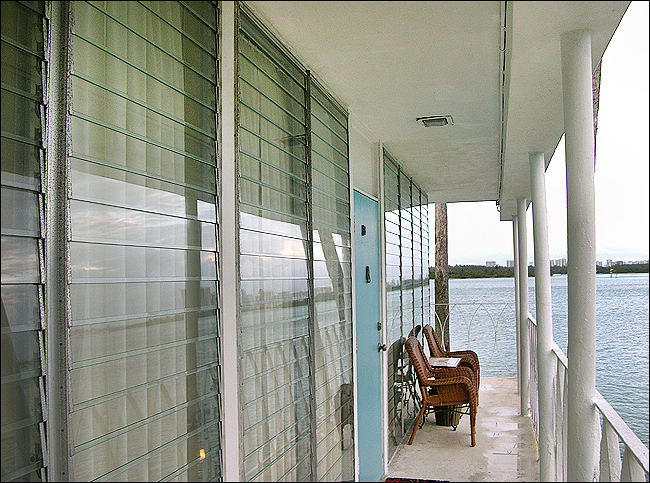 8240 Palm Terrace, apartment #10B, in Miami, Florida. A. We see Dexter's apartment in almost every episode, starting with a shot of it seven minutes into the first episode. 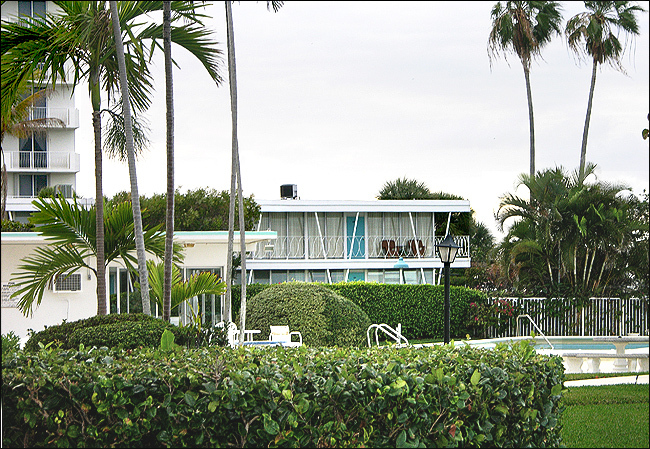 It's where Dexter lives, and where he keeps his trophy slides (with his victims' blood) hidden in his air conditioner. It's also where the "Ice Truck Killer" broke in and left a dismembered Barbie doll in Dexter's refrigerator. And it's where the killer returns to attack a sleeping Debra in the season finale. We get our best look at the apartment exterior in Episode 10 (of Season One), "Seeing Red". where we see Dexter pilot his boat up to the dock of his condo. Another good view of the exterior is seen in Episode 2 - "Crocodile". been holding on to it. He and Rita move into a house. But when Dexter moves out, his sister Debra moves in. In Season 5, after Rita's death, Dexter moves back into the apartment with Debra, so she can care for the baby, and later, after he's hired a nanny, Debra moves out, leaving Dexter alone in the apartment once again. Once again, they recycled old footage of the Miami exterior from the first season. But in the first episode of Season 5 ("My Bad"), they once used another exterior, this one in Long Beach. Most of the time, though, we only see the interior (which is just a set built inside a studio). In Season 7, they surprised me again, when they shot a scene on the lawn of these apartments, at an L.A. location. A. An actual apartment house (a condo to be specific). A. The condo actually is in Miami. Or at least it was. 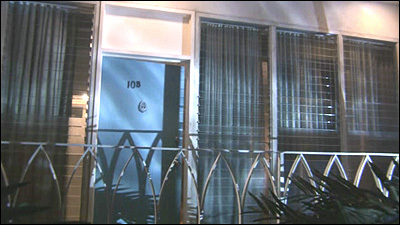 After shooting the original scenes of the apartment in Miami, the producers built a replica of the apartment inside the Sunset Gower studio in Hollywood, CA - including a reproduction of the exact Miami view you'd see if you looked out Dexter's front door. But they shot the first few episodes there in Miami. That's out on the north tip of the easternmost of the two Bay Harbor Islands, in Biscayne Bay. You get there by taking a bridge/road called Broad Causeway, which starts (on the west side / mainland) at North Bayshore Park, in North Miami. 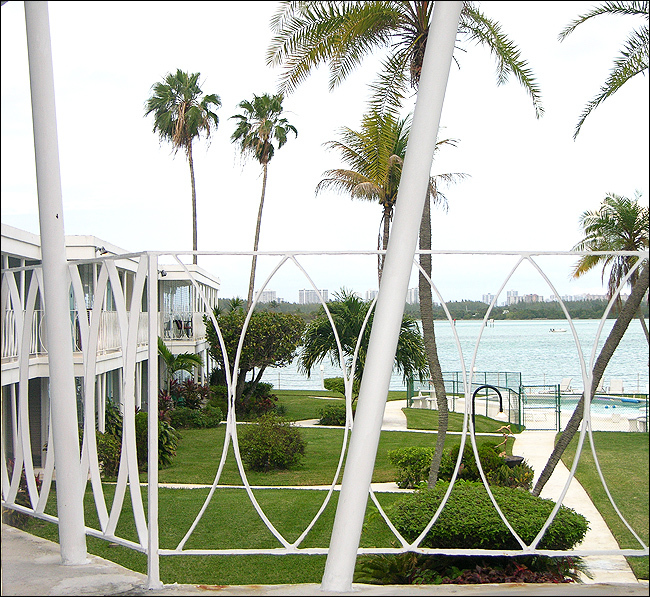 The condo consists of 24 apartments, with a heated pool, a private park, and a great view of Biscayne Bay. As of 2008, the condo units in the Bay Harbor Club were selling for around $175,000 to $325,000 (for the penthouse). Here is an aerial photo of the location. And here is a map link. I just wanted to give you an update on the Bay Harbor Club apartments. My wife and I were there in September, and they have completely locked down the apartments. There are gates at the entrance that you must know the code to get in. There are signs around the gates saying that the police will be called if you are trespassing. If you walk to the right, when you are looking at the front of the Bay Harbor Club, you can get a glimpse of the apartment between the Bay Harbor Club and the apartment complex next to it. If you continue walking around that (next door) apartment complex you can catch another glimpse, but that apartment complex too has locked gates. A. This one was a bit tricky. Since most of the "Dexter" locations are really in Southern California, the first thing I had to do was eliminate the Long Beach shoreline and Marina Del Rey as possible locations. I also took a quick look at Miami's coastline, but since I wasn't sure it was a real Miami location (and since I live in L.A.), I held back doing an intensive search in Florida. But then, I listened to the producers' commentary on the DVD version of the Season One final episode, and they said that the original apartment was in "North Miami". I thought that would make it easy to find - just look in the northern part of Miami. Fortunately, those four areas turned out to be fairly close together, so when I started using Live Local's "Bird's-Eye" aerial photos to scour the Florida coastline, I didn't have that much ground to cover. I had a few clues to go on: the large green lawn in front of his apartment house, the unusual diagonal railings in front of his room, the tall building behind his apartment, and the long apartment building across the lawn in front of his apartment. Plus, of course, it was obvious that it was right on the water's edge. But I looked at every building along the coast, one by one, then moved on to the islands, and eventually found it. Once I had found the location in the aerial map photos, I started looking for the name of the apartment complex and its exact address. I Googled the name of the island and the word "apartment", which turned up several apartments. 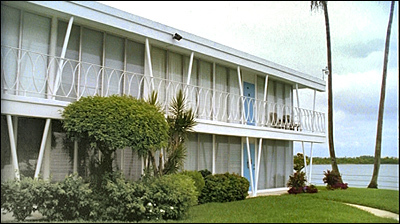 Then I narrowed it down by looking at photos in Florida real estate listings of those apartments, until I finally found a photo showing those familiar diagonal railings. 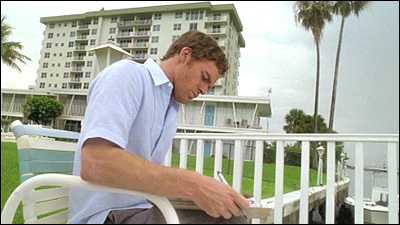 [ I didn't find out that fake/script address of Dexter's apartment until the fifth season (2010), when it was revealed in the scene where Dexter checks on the papers Liddy forged to plant bugs in his apartment. 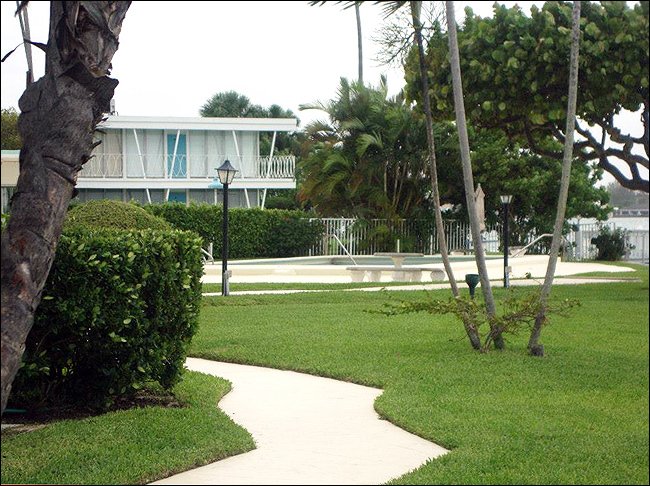 The address was listed on that search warrant Dexter examines: 8240 Palm Terrace, apartment #10B, Miami.